So to my mind it isn't worth a huge level of effort. Nevertheless, today I was building a raised bed for flowers and plants to go in - periodically we buy a number of plants in pots, which I then let die because I forget to water them, it's a sort of death row for vegetation. Sometimes they get a stay of execution when it rains, but I know it's going to come sooner of later. No longer however - in the future they will be in the flower bed, and hopefully (assuming I can hold a watering schedule together long enough to get them bedded in) they will thrive there. It was relatively energetic work for me, but I do admit to a good feeling at the end, when you can see the fruits of your labours. 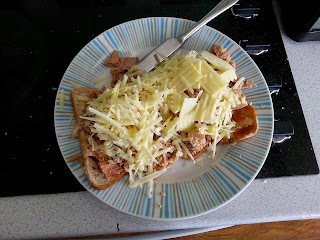 That is hot tuna and mostly grated cheese on toast which has had Heinz Curry Sauce spread on it. It was good.